CAD Stands for Computer Aided Designs. CAD is a type of software which is widely used in Creation, Analysis and Modification of Design on Computer System. The Place of Traditional Paper Pencil and Drafters now has been Occupied by CAD Softwares. The Modern CAD software is relevant, Precise and faster than the old traditional drafting Techniques. CAD is also Called CADD sometimes which stands for Computer Aided Designs and Drafting. CAD is used to Create special effects and Animation in Movies and in industries such as Aerospace, Shipbuilding, Architecture, Mechanical Designs and Electronic Automation. CAD enables Engineers of various branches to draft the drawings and publish them in various formats. There are Many CAD Softwares available in Market such as AutoDesk AutoCAD, Albire Design, Revit, 3d Max, AutoDesk Inventor etc. Each CAD software has its separate method to create Drawings. Some low-end software offers simple two dimensional(2D) Designs and rests others performs advance activities like three Dimensional Modeling and 2D wireframes. The wireframe is the extended version of 2D CAD designs. Every drawing created using CAD software has definite dimensions and properties. A CAD drawing does not show only a solid object but also express its Physical properties like area, volume, density, color and methods through which the object to be created. 2D AutoCAD Designs: Two Dimensional CAD Designs are simple flat designs which show only two dimensions of an object. 3D CAD Designs: Three Dimensional CAD Designs are complex designs as compared to the two-dimensional designs. These type of Designs shows all dimensions of an object from various angles.There are various methods to create 3D objects like wireframe model, Surface model, and Solid objects. All of the CAD software has a different dedicated graphical user interface (GUI) in which the designers work on their computer system. An operator needs to enter the various command in the Command Bar.To create a drawing operator have to specify the position and dimensions of the object.After Finalizing the drawing user can either keep the drawing file in .dwg format(Default drawing format for CAD Drawings) or can plot it into a variety of popular formats. 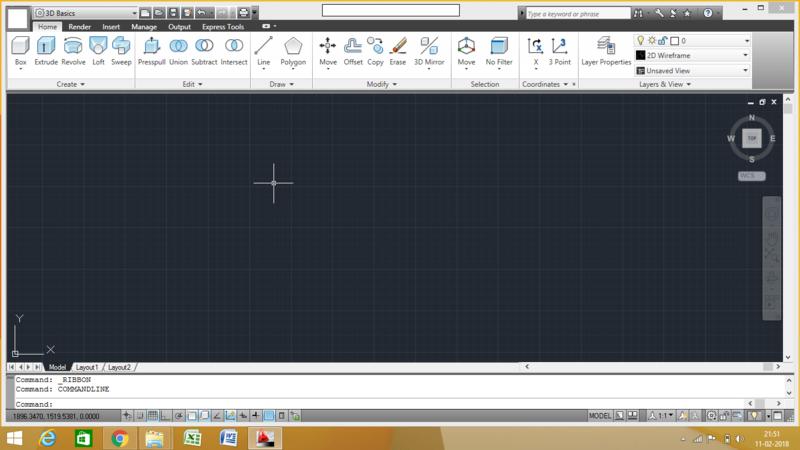 A typical CAD Graphical User Interface.